Strengthening the joints, limiting pain or improving joint structure ... there are many desired effects of supplements on the joints. Check what you can actually expect from a preparation for the joints. See, which supplement you should choose to achieve the desired effect. Not all of them work the same way. Everything depends on the composition and form of use of the supplement. It is hard to expect from a supplement, whose main components are vitamins and herbs, to work as effectively as an injection of hyaluronic acid implicated directly into the joint. 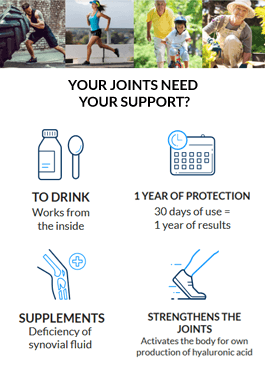 If you do not know what to look for when choosing an effective supplement for joints, see the following article: How to choose a good preparation for the joints. There are many false views on the effectiveness of various components of this type of preparations. Therefore, we should not reach for a random supplement guided by a TV advertisement or another unproven advertising message. Glucosamine is an example, which is a component of most supplements for the joints. 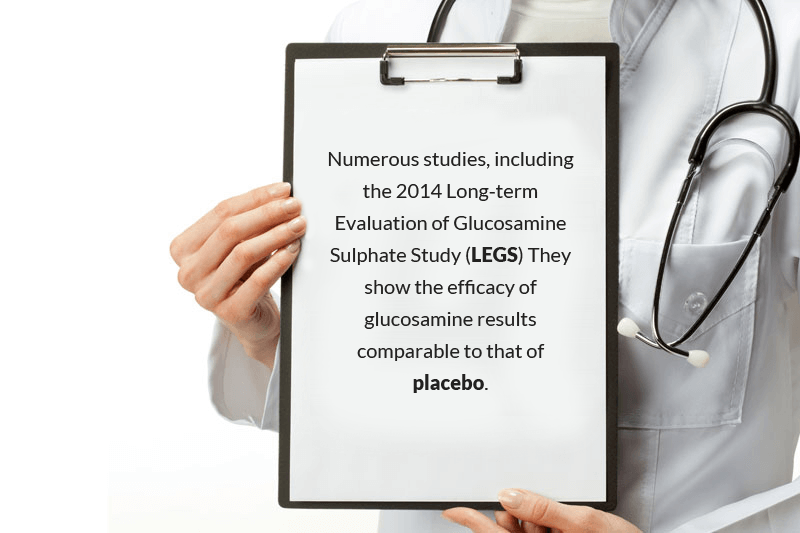 Unfortunately, a number of studies, including the Long-term Evaluation of Glucosamine Sulphate Study (LEGS) from year 2013 indicate that the effectiveness of the results obtained from the use of glucosamine is comparable to the effectiveness of the placebo. It should also be kept in mind that glucosamine as a glucose derivative is not recommended for people suffering from diabetes. People with allergies or blood clotting problems should approach glucosamine with caution. For a supplement to effectively improve joint mobility, it must contain substances that constitute real building blocks of the joints. Hyaluronic acid is one of the most important compounds that affects the proper construction and integrity of articular cartilage. Hyaluronic acid is also a key component of the synovial fluid which directly affects physical properties (viscosity and density of the synovial fluid), and is responsible for lubrication and hydration of the articular surfaces. The natural ability of the joint to produce synovial fluid results in protection of the joints against sudden forces. The effect of synovial fluid can be compared to a shock absorber that protects the joint from mechanical damage. Ensuring proper nutrition of the synovial fluid also has a positive effect on the structure of cartilage itself. This is because the cartilage is nourished by components that are initially secreted into the synovial fluid. In people where a lower concentration and degradation of hyaluronic acid chains occurs in the synovial fluid, the first signs of osteoarthritis can be seen. If, therefore, we expect that the taken supplement will improve the efficiency of the joints, a preparation that contains a large amount of hyaluronic acid should be chosen. Certainly, Hyalutidin is such a formulation which comprises two compounds naturally occurring in the joints, that is chondroitin sulfate and hyaluronic acid. The pain appearing in the joints may be associated with an inflammatory or noninflammatory condition. Non-inflammatory pain in the joints is any mechanical damage that could be caused by excessive exercise or physical injury. Inflammatory diseases are caused by inflammation of the joints and periarticular tissues. Joint swelling and redness of the skin around the joint can occur. Inflammation of the joint limits their mobility and may cause inconvenient pain. In order to reduce pain in the joints it is therefore necessary to dispose of or at least mitigate the reasons that caused these problems. This means that it is not possible to limit pain not acting on the cause of the problem directly. This clearly emphasizes the need for a concentrated dose of the supplement, which will effectively rebuild the damaged structure of the joint. Reducing pain in the joints requires undertaking action, which are aimed at inter alia supplementing the shortage of chondroitin sulfate in the joints. Its deficiency results in faster wear of the articular cartilage and makes it less flexible. With age, the joints lose their natural ability to produce it. Unfortunately, the substance does not occur in conventional food ingredients. So, if we want to repair the deficiencies, we should use the appropriate supplement for the joints, which in its composition includes a concentrated dose of chondroitin sulfate. If you feel that your joints have lost their natural mobility it is worth to use a supplement strengthening the joints. Remember that with age, joint mobility reduces. It is connected inter alia with a continued decrease in hyaluronic acid content in the body, which in turn is a result of the natural processes of aging. The earlier you apply treatment strengthening the joints, the longer you will be able to enjoy a good physical condition. If we care about a real reconstruction of the structure of the joints, a supplemental preparation should be used which contains a concentrated dose of the ingredients that build cartilage and synovial fluid. Such substances are undoubtedly hyaluronic acid and chondroitin sulfate. One of the most effective and most comfortable forms of strengthening joint supplementation is the Hyalutidin liquid formulation for the joints. WHEN IS IT WORTH TO START JOINT SUPPLEMENTATION? It is widely believed that joint problems concern mainly the elderly. Due to the high wear of the joints and the limited ability of the body to self-regenerate them, it is a group of people particularly vulnerable to joint problems. Supplementation should also be considered by people who engage in increased physical activity, which may adversely affect the condition of the joints. Many jobs require working in a position that greatly overloads specific parts of the body. Such a situation can lead to very negative changes in the structure of the joints and, consequently, cause pain. Moreover, young people at the age of 30-40 years should pay attention to their joints. Today's lifestyle leaves a lot room for improvement, fast food, fast life, deadlines at work - all of this affects the health of your joints. IS IT WORTH TO INVEST IN PURCHASING A GOOD SUPPLEMENT FOR THE JOINTS? In response to this question, it is worth to consider how much we value our health, physical fitness and well-being. We should not underestimate any symptoms of joint overloading. Rheumatic diseases are associated with very cumbersome pains that often make it impossible to perform work or daily activities. Therefore, it is extremely important to choose a dietary supplement that can actually improve the condition of our joints.